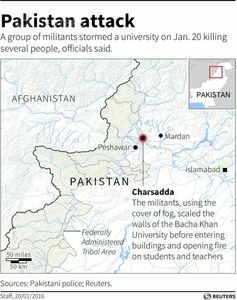 The attack on students of the Bacha Khan university in Charsadda, northern Pakistan, played out according to what has become a disturbingly familiar pattern in the region. It was what is described by armed Islamist groups there as a "fidayeen attack". Fighters of the Pakistani Taliban, TTP, were equipped to blow themselves up, but first shot all those they encountered until they were cornered and shot by security forces. In the run-up to the attack, TTP recruits had received commando-style training and been designated fidayeen, or fighters who are prepared to give up their lives for God. An experienced TTP commander, referred to as an "ustad", or professor, directed covert surveillance of the university. The ustad then devised an operational plan, including delivering the men and weapons to Charsadda without detection. It is now standard practice for the TTP commander to direct the operation by phone, staying across the border beyond the reach of Pakistani security forces. 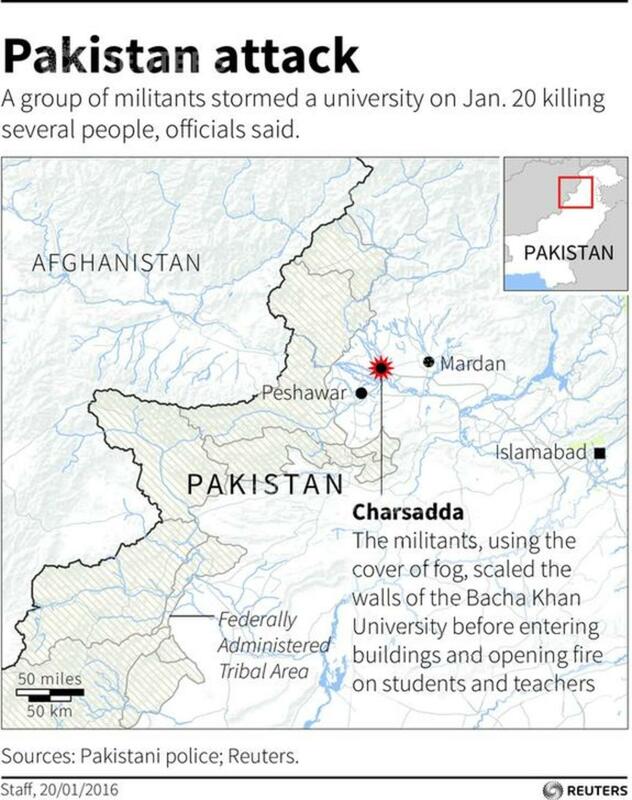 Charsadda, northeast of Peshawar, where the attack occurred. One of the reasons that the university attack has been particularly shocking for Pakistanis is that it took place at a time when the country seemed to have passed the peak of terrorist violence. After a decade of military operations, the Pakistan army has by now penetrated all of the tribal agencies along the frontier. Until June 2014, TTP fighters had secure bases and bomb factories around the towns of Mir Ali and Miranshah, but these were eliminated in the army's North Waziristan operation. During 2015 the Pakistani government also pursued a 20-point agenda of counter-terrorism actions, designed to reduce terrorist financing, recruitment and freedom of operation throughout Pakistan - the National Action Plan (NAP). Deaths from terrorist violence in Pakistan duly fell by a third in 2015 relative to the previous year. But a spurt of other attacks during January point to the limits of what can be achieved through the military operations and NAP framework. Terrorist violence is down but Pakistan is still far from secure. On the same day as the university attack, a suicide bomber in Kabul blew up the staff bus of Afghan TV station, Tolo, killing seven. The Afghan Taliban had previously threatened Tolo and claimed responsibility for the attack. Over the past month, the Afghan Taliban has directed a series of fidayeen operations against a mixture of soft targets and some associated with the military. The ustads who plot the Afghan Taliban attacks in Kabul and the TTP attacks in Pakistan developed their skills in the old camps of Waziristan. In a sense they are all graduates of the same "terrorist university". Both Taliban movements are still able to mount a terror campaign because they have used the time since summer 2014 to relocate themselves, reorganise their logistics, train new fighters and go back into action. The TTP, has suffered a series of splits since 2014. The nominal emir is Maulana Fazlullah, the notorious commander from Swat - but in reality the movement now has neither a charismatic leader nor an effective central command structure. Instead, multiple commanders who emerged while TTP held sway in Pakistan's tribal areas, have established themselves in areas along the border, beyond the control of either government. The shift in mindset, made possible by President Obama’s decision last fall to cancel withdrawal plans, reflects the Afghan government’s vulnerability to continued militant assault and concern that terror groups like al-Qaeda continue to build training camps whose effect could be felt far beyond the region, said senior military officials. The military outlook mirrors arguments made by many Republican and Democrat foreign policy advisers, looking beyond the Obama presidency, for a significant long-term American presence. Senior American commanders have been surprised by al-Qaeda’s resilience and ability to find a haven in the Afghan countryside as well as the Taliban’s repeated seizure of large tracts of contested territory. An important diplomatic precedent for collaboration. The news on Saturday that Indonesia and China will cooperate in cyber war exercises is big enough in itself for strategic relationships in the region. At the same time, it shows that the two countries have an advanced understanding of what cyber war will look like and it sets a new diplomatic precedent in how states must work together in preparing for the most likely impacts of cyber war. The magazine Tempo reported that the two countries will develop a cooperation program that includes “cyber-war simulations, cyber-war responses and mitigations, cyber monitoring, cyber-crisis management, and data center restoration planning.” The intent of this program does not appear to be oriented to joint military cooperation but rather focuses on government responses to the inevitable impacts of cyber war on civil infrastructure. The deepening collaboration in the defense relationship between Indonesia and China is a useful counter to the exaggerated sense of regional polarization over maritime security between China and other South China Sea littoral states, backed by the United States, Japan, and Australia. The relationship between Indonesia and China had been something of a roller-coaster ride between cooperation and enmity in the first half century after 1949, but it has now stabilized on all fronts. As just one example, in October 2015, the two defense ministers met anddeclared their intention to help maintain regional peace. Sydney University published an excellent study of the strategic relationship in November 2015.
joint operations (cyber war simulation, response and mitigation in cyber war, cyber monitoring, cyber crisis management, and resilience). Much in China’s economic slowdown looks reasonable, even favorable. With the Chinese stock market crashing, many have focused, with no small measure of fear, on that economy’s slowdown. Beijing’s statistical office reported recently that the real economy grew 6.9 percent in 2015, down from 7.3 the year before, below the government’s 7.0 percent target—and, as many have noted, also in fear, at the slowest pace in quarter of a century. Other indicators are no more encouraging. Industrial production in the twelve months ended last December grew 5.9 percent, down from earlier reports, while retail sales registered a gain of 11.1 percent, also down from the past. TheInternational Monetary Fund (IMF) expects only 6.3 percent overall growth in the coming year and 6.0 percent in 2017. While Americans, Europeans and Japanese would delight at such statistics in their own economies, the news has nonetheless created considerable pessimism about China’s prospects. Some contend that growth in China is really closer to 4.0 percent, while Chinese business people were rumored to have spoken of only a 2.2 percent growth rate. These many pessimists also note that electricity usage in China has hardly risen at all during the past year and that weak corporate earnings confirm a softer economy than the government figures imply. And because recent government efforts to stabilize financial markets have failed and past government stimulus programs have encouraged a tremendous build up in private debt outstanding, forecasts of a Chinese collapse have multiplied. Surveying this almost universal pessimism, anyone with a memory cannot help but wonder how quickly perceptions change. Not too long ago, while China’s economy averaged real growth of 10-12 percent a year, consensus opinion saw it on the verge of overtaking the U.S. economy as the world’s largest—that China would soon eat America’s proverbial lunch. Now consensus thinking characterizes that once seemingly unstoppable power as a risk to itself and to the global economy. Before, reality failed to match up with the older popular perceptions of China’s unstoppable strength. Now, though it contains much that is troubling about China, reality hardly points to the collapse that so many fear and, indeed, expect. On the contrary, much in China’s economic slowdown looks entirely reasonable, even favorable. Beijing’s efforts to liberalize its financial markets have become much more complicated and increased volatility has been the result. Global financial markets have been rattled by the extreme volatility in China’s equity markets and by pressures for the yuan to depreciate more than just a few percentage points. Some observers interpret the turbulence as evidence of a possible economic collapse with global repercussions. Others believe Beijing intends to use currency depreciation to buoy up exports, potentially triggering rounds of competitive devaluations. Both perceptions are largely misguided. China’s current stock-market gyrations are unrelated to the state of its real economy, which is in little danger of collapsing, though the slowdown will persist. Nor will such a modest depreciation significantly impact trade balances when other Asian currencies have experienced much sharper declines. Then why have these largely China-specific events shaken global markets? Some see the turbulence as an overreaction. But this can’t be the full story given a similar round of swings last summer. Others see more fundamental problems involving Beijing’s unwillingness to allow market forces to guide its economy. Yet China’s strong past performance was due to its receptivity to market-based reforms. China is in fact coming closer to being a more “normal,” market-driven economy. Like other market economies, it is less able to manipulate prices and economic aggregates. This, coupled with globalization, makes China vulnerable to economic cycles. Meanwhile, its current problems stem from being neither a true market economy nor completely state-controlled. Hence the uncertainty. China’s slowdown will be protracted because it involves a longer-term structural shift to more service-driven growth and a shorter-term cyclical adjustment to balance the overbuilt property market. The hope is that this process will be smooth, but underlying pressures shaping these trends suggest that volatility should be expected. Tactical shifts alone will fall short without a change of strategy. Here is the issue: once again, this is tactical creep accompanied by strategic stasis. Helping local forces was the second pillar of Obama’s four-point strategic plan, outlined back in September 2014. Since then, the administration keeps announcing new initiatives that are couched in strategic rhetoric, but are really marginal and cosmetic changes at the tactical level. Recall the announcements of the 450 advisers, the “lily pads,” fifty special forces, and then the 200 U.S. commandos. These shifts are small moves to bolster the military fight against ISIS, but they do not change the strategy at all. A strategic shift would put greater emphasis on governance, providing incentives for coalition allies to fully participate in the effort and pursuing all diplomatic angles with actors on the ground, even the unsavory ones. How to actually change the strategy to take down the Islamic State, if that is truly the desired goal? Start with governance. Right now, “attitudes toward [the Islamic State] are often more favorable than outsiders commonly assume,” according to Mara Rivkin. This is the case because, while the Islamic State is a terrible option for many under its rule, living with the group might be less bad than an unknown alternative. If the United States is serious about changing its strategy, then one of its main objectives should be to provide a viable and effective governance alternative. This is easier said than done. The Islamic State would have to be removed militarily and then outside actors, like the United States, along with its allies and partners, must work closely with whatever civil society is left in the region to rebuild and replace the current governance structure. Water must be potable and readily available, electricity must be consistent and reliable, security must be felt when citizens walk outside their doors, stores must be stocked and, while it seems mundane, the garbage must be picked up. Even a military defeat of the Islamic State will breed resentment if the basic needs of the people are not met. Sadly, governance was not mentioned in President Obama’s strategy rollout, and has not since been included. The liberation of Ramadi will be difficult to replicate. Recently, Defense Secretary Ash Carter said that more American ground troops will be needed in the fight against ISIS. This means more boots on the ground, serving in a more active role. The administration has diligently tried to limit the involvement of U.S. ground troops all along, but the campaign against ISIS has suffered for it. Despite their recent success in Ramadi, it is clear that Iraqi forces are not ready to carry the burden being asked of them, and will need U.S. forces to assert themselves more if ISIS is to be driven out anytime soon. First, the Iraqi Army is simply not large enough to make any kind of serious advance on the other major Iraqi cities under ISIS’s control such as Fallujah and Ramadi. The Iraqi Army currently has a frontline strength of only about 48,000 troops. If we include the Iraqi national police force, that number rises to about 85,000 men. The official size of the Iraqi Army is much larger, closer to 200,000 soldiers, but most of those troops are not combat effective. In fact, Iraq’s security forces were recently rocked by a scandal when it was revealed that the Iraqi Army had 50,000 “ghost soldiers,” soldiers who had abandoned their units but were still drawing a paycheck and were still counted in the official end strength reported by the Defense Ministry. There are simply not enough combat-ready Iraqi soldiers to take Mosul and Fallujah while also securing and holding the territory that the Iraqis have already taken back. This manpower shortage may explain why the Iraqi government, which had wisely sidelined the Iran-backed Shiite militias from the final fight for Ramadi, is considering giving the militias a role in the fight for Fallujah. Underscoring the general ineffectiveness of the Iraqi Army, it was recently reported that most of the hard fighting in Ramadi was done not by Iraqi Army units but by Iraqi Special Forces units, while the regular Army provided security around the city. Iraq’s Special Forces are even fewer in number than Iraq’s effective regular army troops. They are simply in no position to clear and hold a city the size of Mosul. A related factor that aided the fight against ISIS is that nearly the entire civilian population of the city had fled. Only about 10,000 civilians were still in Ramadi at the time of the city’s fall—this in a city that once had about 450,000 residents. The absence of Ramadi’s civilian population meant there was little need to worry about civilian casualties. This approach came with a heavy cost, but at least it pushed ISIS out of the city. LONDON — Hopes for a year less defined by international terrorism threats were dashed Monday by the European law enforcement agency, which warned that there was "every reason" to expect future attacks in Europe. Rob Wainwright, head of the European Police Office (Europol), said at a meeting of interior ministers that the Islamic State had “developed a new combat-style capability to carry out a campaign of large-scale terrorist attacks on a global stage, with a particular focus in Europe.” Apart from "lone wolf" attacks, Europe increasingly faces the prospect of large-scale, organized, mass terror attacks, according to the agency. The meeting in Amsterdam was held amid heightened fears of terror attacks on European capitals similar to the ones in November in Paris. On Sunday, the Islamic State released a video that featured the Paris attackers and included footage showing some of them executing hostages. "Expect a mujahid to show up to kill you," the alleged ringleader of the Nov. 13 Paris attacks, Abdelhamid Abaaoud, said in the video. Abaaoud was killed during a shootout with police in a Parisian suburb days after the attacks. The video included general threats against Europe but also showed several landmarks in London, including the Tower Bridge -- raising concerns about possible plans by the Islamic State to strike in Britain. On Friday, US Defense Secretary Ashton Carter announced that elements of the 101st Airborne Division would deploy to Iraq and Syria to help crush Daesh. For their part, Russian military experts are convinced that the US operation is merely an attempt to get in on the action before the war ends, so that Washington can share in the spoils of victory. Meet the Storied US Brigade That Will Put Boots on Ground in Syria, Iraq"They will head there with the support of the American people and armed with a clear campaign plan to help our allies deliver the barbaric organization a lasting defeat," Carter wrote, in an article published by US politics newspaper Politico. According to the defense secretary, the primary objective of the mission, estimated to involve about 1,800 US troops from the 101st Airborne Division, will be to force Daesh out of their two power centers in Mosul, Iraq, and Raqqah, Syria. In a subsequent interview for CNBC at Davos, also on Friday, Carter emphasized the urgency of the operation. "We need to destroy them in those two places, and I'd like to get on with that as soon as possible," he clarified. The deployment, which has already been discussed with US Central Command and the commanders of the 101st Airborne Division, now awaits Congressional authorization. For his part, Syrian Ambassador to Russia Riad Haddad has already indicated that Damascus will object to the Pentagon's plans in the strongest possible form. "Any interference in Syria's affairs, without the consent of the Syrian government, is looked upon as aggression against the Syrian people," Haddad said, cited by Russian media. Summary: This month’s hot undernews concerns the small epidemic in Ukraine, said to be caused by release of the California Flu from a US research lab. Here we do the usual diagnostic, tracing the story from its origin as propaganda by rebels to its appearance as exciting news on popular websites. How many people have come to believe this story? We have to do better if we’re to regain control of America. The next I see is “Deadly virus leaked from US laboratory in Donbass – DPR Army and Intelligence“, also posted by DNI News, 22 January 2016. It adds more detail. The story was picked up by several dozen websites. It hit the big time rumor-mill with “US Unleashing Deadly Virus in Donbass, Ukraine?” by Stephen Lendman (bio here) at the Center for Research on Globalization, on January 24. Lendman reports as fact this propaganda from the Russia-backed rebels (the Donetsk People’s Republic has not been recognized by any nation). It is worrying that Western Russianists, specifically, in America, are missing the mark on the Kremlin’s foreign policy in the Near East. This point only became more acute over New Year’s 2016 when a slew of articles in both the English and Russian press appeared that argued that Moscow was now in trouble in Syria and with other Arabs for the Kremlin’s policies. Nothing could be further from the truth. Moscow’s military operations in Ukraine and Syria expose a fundamental distinction in approach: trying to extract itself from the former while showing no sign of applying that strategy to the latter. Officially, an “all is well” message is promulgated by the Russian political-military leadership concerning the air campaign in Syria. Perhaps carried away by the euphoria of conducting its first out-of-area operations since Afghanistan, speculation has arisen about the opening of a new airbase in Syria, close to the Turkish border, prompting denials from officials (Nezavisimoye Voyennoye Obozreniye, January 25). The military media works tirelessly to advance the idea that the air campaign is working, without really addressing underlying issues such as strategic aims and objectives, or acknowledging the limited scope of the close air support for disparate ground forces’ groupings (Krasnaya Zvezda, January 24). Some breaches in the rather optimistic narrative have appeared, and may well presage the exposure of deeper systemic problems. The first stems from why the Aerospace Forces (Vozdushno Kosmicheskikh Sil—VKS) and defense ministry, despite President Vladimir Putin’s claim that the operation is “temporary,” appear to adopt a less than hurried approach. In fact, this originates in the terms of the bilateral agreement that laid the basis for Russian operations in Syria. The Russian government took the unusual step of releasing the content of the agreement reached and signed in Damascus on August 26, 2015. According to the bilateral agreement, the VKS can use the Latakia airbase indefinitely and free of charge. Moscow can send any weapons, equipment and materials that it deems necessary, while all military personnel enjoy diplomatic immunity. The agreement reached in Damascus stipulates that Russia’s contribution to a campaign against terrorism and extremism is for “an indefinite period.” Russian commentators regard the treaty as fairly standard, and downplay the “indefinite period,” as simply avoiding setting deadlines for the operations (Gazeta, January 15). While the VKS may be in no hurry to end its operations in Syria, it is clear that the intervention marks a shift in Russian military policy as well as providing a new testing ground for advanced systems. A commentary in Nezavisimoye Voyennoye Obozreniye noted that the VKS operation in Syria is quite unlike Russia’s use of military force since the end of the Cold War. It also noted that some experts had labelled it as the “first Russian war in American style,” relying on air power, long-range strikes with precision weapons, and with minimal risk to its troops and forces. The commentary focused on how Western analysts have adopted a broadly positive interpretation of the Russian military operation, which according to the author is rooted in the tendency to overly compare it with the Five Day War with Georgia in August 2008 (Nezavisimoye Voyennoye Obozreniye, January 15). The Russian financial situation is heading south again - and fast. Crude oil prices of less than $30 a barrel are bad enough, but Russia can't even fetch that. The country's "sour" high-sulfur export blend, Urals Export Blend Crude (UEBC), is trading at $26 a barrel - or less. Natural gas is faring even worse. The fact is, Russia is dependent on oil and natural gas exports to buoy its unwieldy central budget. So the world's largest country is in trouble, and serious trouble if it can't find a way out. There is a way out, though there's only one option, and it's far from certain whether Putin can make it happen. Before you make the investment I'm about to show you, it's very helpful if you understand the unvarnished truth about Russia's energy-dependent economy. Natural gas is now so cheap that Gazprom PAO (OTCMKTS ADR: OGZPY), Russia's state-controlled - and the world's largest - gas behemoth, is barely recouping extraction costs. The value of Gazprom depository receipts traded in London and New York are down 36% and 49%, respectively, in barely a year. The price of exported gas is adjusted, based upon a basket of crude oil and oil product prices. Both have gone down, dragging with them the revenue realized from selling gas abroad. In addition, competition from elsewhere - especially North African and other shipments of liquefied natural gas (LNG) - are reducing reliance on Gazprom's long-term, "take-or-pay" contracts. Take-or-pay requires the buyer to import a set amount per month - or pay as if they had. That's bad for Russia, but it's about to get even worse. That competition will increase as American LNG exports are phased in. Even Gazprom acknowledges that the United States will account for at least 6% of the world's LNG market by 2020, up from 0% today. That merely accentuates the Russian export quandary. The much ballyhooed agreement for Gazprom to export gas to China will not result in a net addition of sold volume anytime soon. Now, the price of this gas has not been disclosed publically. But you can be sure that Beijing will be pushing for a lower price than what Russia currently charges Western Europe. Meanwhile, the country's domestic situation is also deteriorating. Russia's fuel subsidies are making the energy price crunch much worse. You see, Russia subsidizes oil products and natural gas domestically to cushion the impact on consumers. That limits the ability of companies like Gazprom or dominant state oil company Rosneft OJSC (OTCMKTS: RNFTF) to offset revenue losses abroad by increasing domestic consumption. Vladimir Putin has denounced Lenin and his Bolshevik government for their brutal repressions and accused him of having placed a “time bomb” under the state. The criticism of Lenin, who is still revered by communists and many others inRussia, is unusual for the Russian president, who in the past carefully weighed his comments about the nation’s history to avoid alienating some voters. At the same time, he signalled that the government had no intention of taking Lenin’s body out of his Red Square tomb, warning against “any steps that would divide society”. As an example of Lenin’s destructive legacy, Putin pointed to Donbass, the industrial region in eastern Ukraine where a pro-Russia separatist rebellion flared up weeks after Russia’s March 2014 annexation of Crimea. More than 9,000 people have been killed in the conflict since April 2014, and clashes have continued despite a February 2015 peace deal. He said Lenin’s government had whimsically drawn borders between parts of the USSR, placing Donbass under the Ukrainian jurisdiction in order to increase the percentage of proletariat in a move Putin called “delirious”. Putin’s criticism of Lenin could be part of his attempts to justify Moscow’s policy in the Ukrainian crisis, but it also may reflect the Kremlin’s concern about possible separatist sentiments in some Russian provinces. The Italian government has been in a rebellious mood of late. During a war of words with the European Commission over his plan to increase spending this year, Prime Minister Matteo Renzi told Brussels "Italy is back, more solid and ambitious." In an op-ed published in The Guardian a few days later, Renzi added that "the political and cultural orthodoxy that has monopolized thinking on how Europe should be run for the last decade isn't working" and promised that "Italy will not stop demanding to have its voice heard." To be sure, Italy - the third-largest economy in the eurozone and a net contributor of funds to the European Union - believes it has cause to be annoyed with the bloc's officials. Rome views Brussels' constant requests for spending cuts as an obstacle to economic growth. It is also disappointed by the lack of progress in EU efforts to address the migration crisis. More recently, doubts over the health of Italian banks reignited a debate between Rome and the European Commission over Italy's plans to protect its banking sector. But Italy's recent actions are based on more than short-term calculations; they are intimately connected to the way the country sees the world. To understand Rome's behavior, it is necessary to consider how modern Italy was born and what shapes its policies. Present-day Italy was created by combining dozens of unconnected pieces, constantly at risk from over a millennium of foreign invasions. Elements of Italian history mirror the European Union's attempts to create a united Continent, and they offer clues to the bloc's future. Italy is a mountainous country. The Alps serve as a natural border with its northern neighbors, while the Apennines bisect the Italian Peninsula from north to south. Italy also controls Sicily and Sardinia, the two largest islands in the Mediterranean. This fragmented geography facilitated the emergence of strong local identities, something exemplified by the extensive variety of dialects spoken in the country. Major geopolitical shifts and internal dynamics are setting the stage for possible increased great-power competition in Central Asia between Russia and China at a time when the region is becoming less hospitable to the projection of U.S. power and to the promotion of democracy. Major geopolitical shifts and internal dynamics are setting the stage for possible increased great-power competition in Central Asia between Russia and China at a time when the region is becoming less hospitable to the projection of U.S. power and to the promotion of democracy. U.S. policy will need to adapt to these changes in order to bring Washington’s ambitions in Central Asia into better alignment with limited U.S. interests and means. Overpromising and setting ambitious but unrealistic goals will lead to mutual frustration, cynicism, and disappointment among the five states of Central Asia. A policy grounded in a realistic view of the region and U.S. interests there will better serve everyone’s interests. As the United States continues on a glide path toward a substantially smaller military footprint in Afghanistan, Central Asia’s importance as the gateway to Afghanistan will decline in America’s strategic calculus. Central Asia’s first quarter century of independence was marked by a geopolitical orientation toward the West. 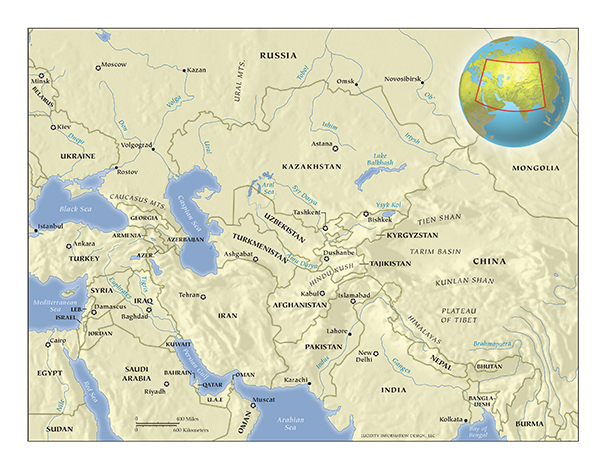 The United States helped the five Central Asian states establish their independence and sovereignty. America fulfilled its promise of partnership at that crucial stage, and these states have been important partners to the United States at critical times. Central Asia is on a different trajectory now. The region is in the midst of a major geopolitical shift that will diminish its ties to the Euro-Atlantic community and will elevate China’s influence in and importance to Central Asian states. For the foreseeable future, Beijing and Moscow will be the region’s principal economic, political, and security partners due to China’s preeminent regional economic power and Russia’s residual presence. These developments portend declining American presence in and influence over the region—and greater difficulty in transforming Central Asian states into democratic, free-market economies knitted together by regional economic integration. Advancing Washington’s priorities in this new environment will require significant changes in U.S. policy. Prioritize U.S. regional engagement with Kazakhstan and Uzbekistan. Recognize that the United States shares some interests with Russia and China and seek to harness Russian and Chinese actions to advance U.S. interests. Let demands for change be locally driven and focus the U.S. reform agenda on improving social and economic conditions rather than on democracy promotion. Do not condition security cooperation on human rights performance. Avoid militarizing U.S. policy by overreacting to the threat of Islamic extremism. Use leverage more effectively by playing harder to get and pursuing more realistic and prioritized goals. Did Ukraine's Cyberattacks Originate in Russia? As Ukraine grapples with a plethora of challenges, including endemic corruption and trade disputes with Russia, cyberattacks against the country's critical infrastructure can now be added to the list of issues. In late December, Ukraine experienced what may have been the world's first blackout caused by a cyberattack. While the blackout was short-lived, it affected eight provinces in western Ukraine and cut power to over eighty thousand people. Investigators now say at least eight utilities were targeted by malware, although only two experienced power outages as a result. 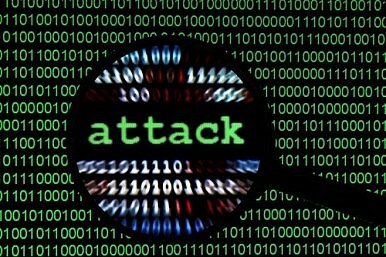 Then, one month later, another cyberattack hit the IT network of Kyiv's main airport. In both cases, Ukraine's officials lay the blame on Russia, pointing out that the malware used in the attacks was previously linked to the Sandworm team, a hacking group that security researchers suspect is backed by Moscow. Still, pinpointing the origins of a cyberattack is notoriously difficult, and many of the details surrounding the attacks remain murky. Experts are still struggling to determine how the hackers caused the blackout, and evidence linking the attacks against the utilities with those against the airport remains elusive. "Anytime we're talking about the geopolitical arena and cyberattacks, you always have to consider the motivations of the parties involved, beyond just the technical details," says Tim Erlin, director of IT security at Tripwire, a US-based cybersecurity firm. "But unless a group specifically claims responsibility, we're making guesses. They may be educated guesses and they may be accurate, but you aren't going to achieve certainty." WASHINGTON — Twenty nations with significant atomic stockpiles or nuclear power plants have no government regulations requiring minimal protection of those facilities against cyberattacks, according to a study by the Nuclear Threat Initiative. The findings build on growing concerns that a cyberattack could be the easiest and most effective way to take over a nuclear power plant and sabotage it, or to disable defenses that are used to protect nuclear material from theft. The countries on the list include Argentina, China, Egypt, Israel, Mexico and North Korea. The survey, by one of the nation’s leading nuclear nonproliferation watchdogs, was based on a nation-by-nation review of basic, publicly available data, and some of the countries may claim they have classified protections in place. But the list is damning. The group looked, for example, at whether any cyberprotections are required by law or regulation at nuclear facilities, and whether cyberattacks are included in the assessments of potential threats to the security of those installations. One question asked whether there were mandated drills and tests to assess responses to a cyberassault, rather than just a physical attack on the facilities. “Twenty countries failed on all the indicators,” said Page Stoutland, one of the authors of the report. Because of the secrecy surrounding military nuclear facilities, it was impossible to determine the levels of cyberprotection used to protect nuclear weapons in the nine countries known to possess them. The report also concludes that President Obama’s global initiative to sweep up loose nuclear material, which will be the subject of his third and final nuclear security summit meeting this March, has slowed substantially. The NTI Index theft ranking includes two sets of data: countries with one kilogram or more of weapons-usable nuclear materials and countries with less than one kilogram of or no weapons-usable nuclear materials. Browse overall country scores or explore the data by category and indicator on the map below. The equal sign (=) denotes a tie between or among countries. All countries are scored 0-100, where 0 and 100 represent the lowest or highest possible score, respectively, as measured by the NTI Index criteria.